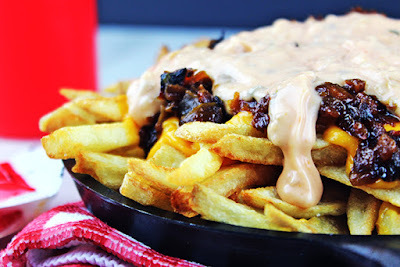 Animal-Style French Fries are fried golden brown, topped with melty American Cheese, buttery melted caramelized onions and a signature fry sauce. Serve with a fork or eat with your fingers if you dare, these fries are a cult favorite! Kenji’s delicious recipe for the Double Double Animal-Style Cheeseburger was such a spot on hit, I’ve carried it through to the next day to recreate the Animal Style French Fries to accompany it. Kenji declined to make the French fries because he declared that In-N-Out has never really been known for their fries. This, I hate to admit, is pretty true. The French fries were always the weakest link in the very short chain of a menu with only a double cheeseburger, cheeseburger, hamburger and fries on the menu. Keep the sliced potatoes in a bowl of cold water while you prepare the rest of the ingredients. Heat 1 tablespoon butter in a skillet over medium-high heat until shimmering. Add onions and 1/2 teaspoon kosher salt to skillet. Reduce heat to medium low, and cook, tossing and stirring occasionally until onions are well browned, about 15 minutes. Once onions begin to sizzle heavily and appear dry, add 1 tablespoon water to skillet and stir. Continue cooking until water evaporates and onions start sizzling again. Repeat process, adding 1 tablespoon of water with each iteration until onions are meltingly soft and dark brown, about 3 times total. Transfer to a small bowl and set aside while leaving any residual butter in the pan. To make the animal fry spread: Add mayonnaise, ketchup, relish, sugar, and vinegar to a small bowl and stir to combine. Fry for 3-4 minutes or until the fries start turning a bit whiter. Remove with slotted spoon and do the next batch. To double fry, put the potatoes back in the hot oil after they've cooled and fry a second time for 2-3 minutes, or until golden brown. Place fries on plate, cover with slices of American Cheese, melted onions, and the animal style spread. Sauce and Onions adapted from Kenji at the Serious Eat's Food Lab. 0 Response to "IN-N-OUT ANIMAL STYLE FRENCH FRIES (COPYCAT)"